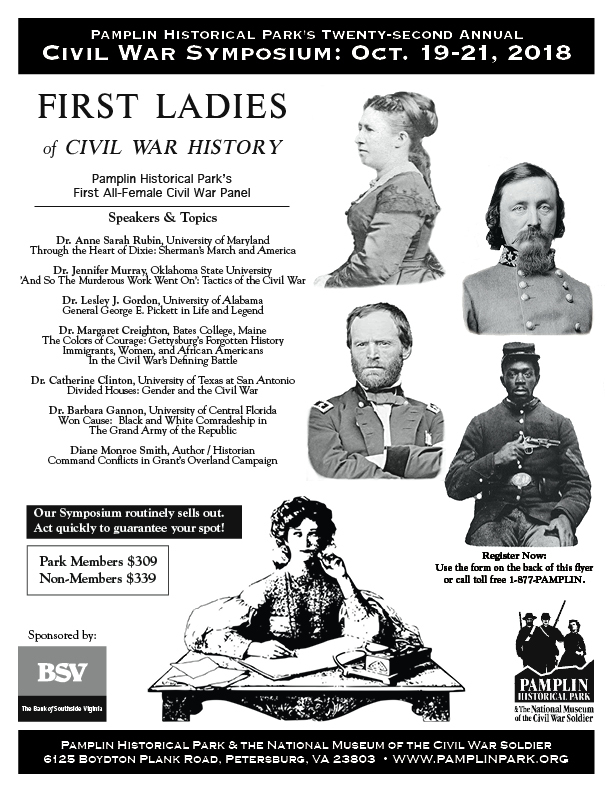 Join us for our 22nd Annual Civil War Symposium: First Ladies of the Civil War on October 19-21, 2018. This year’s symposium features a first ever all-female award-winning speaker panel of leading Civil War historians from across the country. Symposium topics vary from “Sherman’s March to the Sea” to “The Colors of Courage: Gettysburg’s Forgotten History Immigrants, Women, and African Americans in the Civil War’s Defining Battle”. The speakers are; Dr. Anne Sarah Rubin of University of Maryland, Dr. Jennifer Murray of University of Virginia at Wise, Dr. Lesley J. Gordon of University of Alabama, Dr. Margaret Creighton of Bates College, Maine, Dr. Catherine Clinton of University of Texas at San Antonio, Dr. Barbara Gannon of University of Central Florida and Diane Monroe Smith. All of these esteemed speakers have been recognized in the field of Civil War history with awards ranging from the Lincoln Prize to the Wiley-Silver Prize for Civil War publications. The Symposium begins on Friday night with a reception at the Park where attendees and speakers can meet and enjoy refreshments. Saturday is filled with lectures and opportunities to purchase published works by the speakers for autographs and participation in a silent auction. Sunday will feature additional speakers and a panel discussion to include Dr. Francoise Bonnell, Director of the U.S. Army Women’s Museum at Fort Lee, VA. Symposium pricing is $339.00 per attendee, which includes all lectures, the Friday night reception, two mid-morning coffee breaks, two lunches, and a Saturday night banquet. A special Symposium tour “The Hidden Treasures at Fort Lee” held on October 19 is available for and additional $89.00. Space is limited and pre-registration and payment are required for both the Symposium and special tour. A letter of confirmation will be sent to all registrants. Call (804) 861-2408 or visit www.pamplinpark.org for more information and to register today. Space is limited so register today. See and print registration form here.